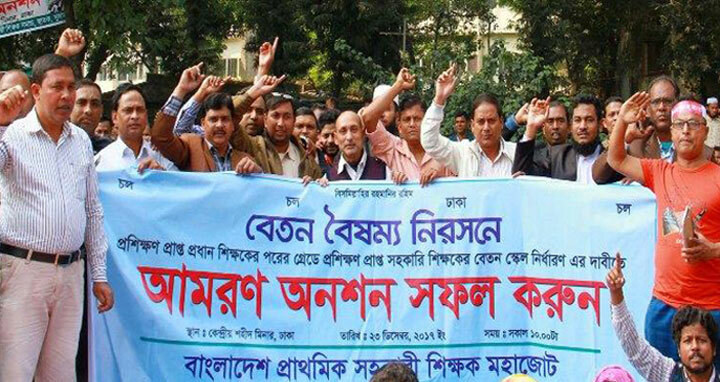 Dhaka, 23 Dec, Abnews: Assistant teachers of primary schools have undertaken fast-unto-death since Saturday demanding their salary scale to be raised just next to the headmasters' of school. A combined platform of assistant teachers of 10 organizations, began the strike at Central Shaheed Minar. Earlier, assistant teachers of primary schools threatened to go on fast-unto-death from December 23 if their jobs were not upgraded from 14th grade to 11th grade in the eighth national pay scale by December 22. Headmasters of the primary schools are in the 10th grade in the 8th national pay scale while assistant teachers are in the 14th grade with the same educational qualification.